The California Chamber of Commerce reaffirmed support for the U. S.-Korea Free Trade Agreement (KORUS) in a letter sent September 5, 2017 to members of the Trump Administration, including the Secretary of Commerce and the US Trade Representative. 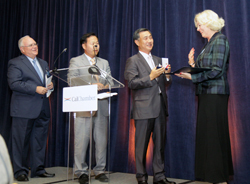 On December 6, 2012, the California Chamber of Commerce received the prestigious Presidential Citation from the government of the Republic of Korea for promoting U.S.-Korea trade and commercial relations, and specifically for contributing to the passage of the U.S.-Korea Free Trade Agreement (FTA). The CalChamber was an early supporter of the U.S.-Korea FTA, the culmination of a five-year process from negotiations, to passage and implementation. Pictured: Consul General Jeong Gwan Lee and Consul Kwang Ho Lee of the Korean Consulate General in San Francisco present the Korean Presidential Citation to Mrs. Susanne Stirling, Vice President International Affairs, with 2012 Chair Tim Dubois observing. “KORUS FTA Facts and Figures“ is a six-month overview of bilateral trade statistics since the KORUS FTA was implemented, released by the Embassy of the Republic of Korea in Washington, D.C.
March 15, 2012 is the implementation day for the landmark U.S.-Korea Free Trade Agreement (FTA), the product of years of collaboration by the business community and both governments. The California Chamber of Commerce-supported FTA is the biggest free trade pact the United States has reached since entering the North American Free Trade Agreement (NAFTA) in 1994. Recognition goes to U.S. Trade Representative Ron Kirk for his leadership in getting the U.S.-Korea FTA to the finish line. The United States has welcomed the newly appointed South Korean Ambassador to the United States, Choi Young-jin. His Excellency Duk-Soo Han, former Prime Minister and Ambassador to the United States from the Republic of Korea, was instrumental in garnering support for the U.S.-Korea agreement. Han spoke to the CalChamber on several occasions, as did the Consuls General of Korea in San Francisco and Los Angeles. SJR 4 (Harman: R-Huntington Beach) U.S. – Korea Free Trade Agreement. The CalChamber was part of a broad-based coalition that waged a multi-year campaign to secure congressional passage of the U.S.-Korea FTA. Congress approved the FTA on October 12, 2011. The South Korean Parliament followed suit on November 22, 2011. The United States and the Republic of Korea announced on February 2, 2006 that they were beginning negotiations toward a bilateral FTA, with talks expected to take up to a year. Although the negotiations concluded on April 1, 2007, nearly five years passed before the FTA could be implemented. The U.S. – Korea FTA was passed by the U.S. Congress on October 12, 2011. Implementation of the U.S.-Korea FTA eliminates tariffs and other barriers to trade in goods and services, promote economic growth, and enhance trade between the United States and Korea. Korea is a $1.4 trillion economy and its commercial relationship with the United States is largely complementary. In 2016, two-way trade between the two countries totaled over $112.2 billion. In 2016, U.S. goods exports to Korea were nearly $42.26 billion, a small decrease from 2015. According to the most recent figures, U.S. foreign direct investment in Korea totaled roughly $34.6 billion and was concentrated largely in the manufacturing, banking, and wholesale trade sectors. 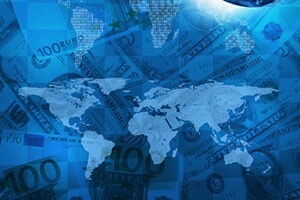 Korean foreign direct investment to the United States reached $40 billion. Korea is California’s sixth largest export destination. 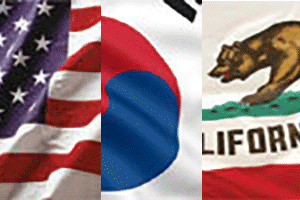 California is the top exporting state to Korea, making up 20 percent of U.S. exports to Korea. In 2016, California exported over $8.2 billion to Korea. The U.S.-Korea FTA greatly expands market access in Korea for U.S. farmers, manufacturers, service providers, and financial services firms. Under the FTA, more than half of current U.S. agricultural exports to Korea—with a value of more than $1.4 billion—will become duty-free immediately, including high-value agricultural products such as almonds, pistachios, wine and cherries. For many other key agricultural goods, such as pork and citrus products, the FTA will provide unparalleled access to the South Korean market and its prosperous consumer base. Almost 95 percent of all bilateral trade in consumer and industrial products will become duty-free within three years under the agreement, and virtually all remaining tariffs on consumer and industrial goods will be eliminated in 10 years. Moreover, this agreement eliminates significant non-tariff market access barriers in Korea to U.S. goods, services and investment. Consumers in both countries stand to gain from the broad benefits of this agreement. U.S. interests are protected under this agreement through robust provisions on transparency, intellectual property rights, competition, investment and other rules, particularly in the area of services. The agreement also has important implications beyond bilateral trade and investment. By giving U.S. exporters and investors a preferential position in the world’s 12th-largest economy (International Monetary Fund), an FTA with Korea enhances U.S. businesses’ ability to compete in the dynamic Northeast Asia regional economy. From a strategic vantage point, the FTA reinforces the critical partnership and alliance between the United States and Korea. Korea is a significant market for U.S. small and medium-sized companies, which make up a majority of U.S. businesses exporting to Korea. The Republic of Korea is a longstanding and close U.S. ally, and strong partner in advancing regional and global security. The U.S.-Korea FTA reinforces this critical economic and political partnership by deepening the links between the United States and Korea as they work together to protect peace and prosperity in Northeast Asia. There are over 1.6 million Korean-Americans in the United States. There is also a large population of Korean students studying at higher education institutions across the U.S. Korean visitors eneter the U.S. via the U.S. Visa Waiver Program. For California, the FTA is a big win. California’s exports of machinery also benefit from U.S.-Korea FTA reductions as machinery manufactures accounted for just under $2 billion of the state’s merchandise exports to Korea in 2016. According to the International Trade Administration in the U.S. Department of Commerce, transportation equipment accounted for $1.997 billion of California’s merchandise exports to Korea in 2016. With immediate removal of many of these related tariffs, exports have become more competitive and affordable to Koreans. Computer and electronic products accounted for $1.2 million of the state’s export sales to Korea in 2015 and most of these duties also would be eliminated immediately. In addition, tariffs and other barriers would be eliminated on most agricultural products produced in California. The U.S.- Korea FTA sends a strong signal that the United States intends to remain heavily engaged in the region for a long time to come in business, economics, security and international politics. The FTA strengthens a more than 60-year-old alliance between the United States and South Korea, while reinforcing the economic and political reforms South Korea continues to make. updated LinkedIn and Twitter profiles.